With the focus on Joko in Indonesia, Malaysia’s crackdown on the opposition is receiving little attention. In addition, over the past year the Malaysian government has investigated and/or charged at least thirty people with sedition, under an archaic law it had promised to eliminate, according to the Malaysian Bar Council. Most of those investigated and charged have been journalists, opposition politicians, and prominent civil society activists. The situation has gotten so dangerous for Malaysian civil society that last week hundreds of Malaysian lawyers, who normally are relatively passive in the political arena, marched through the capital to protest the government’s use of sedition laws to stifle dissent. Why has this crackdown occurred? Najib has had to satisfy hard-line voices within his ruling coalition, and to fend off increasingly public criticism from former prime minister Mahathir Mohamad. To satisfy hard-liners and Mahathir supporters—often the same people within the ruling coalition—Najib apparently has acceded to this harder-line policy against civil society and opposition politicians, whether or not he actually supports the crackdown. In many ways, Najib seems increasingly divorced from the business of governing at all, taking long overseas trips while the country stagnates economically, state carrier Malaysian Airlines faces severe trouble, and the political environment becomes increasingly partisan and dangerous. Although the Obama administration made improving relations with Malaysia a policy priority, it has mostly ignored the deteriorating climate for human rights and democracy in the country. When President Obama visited Malaysia earlier this year, he declined to meet with opposition leader Anwar Ibrahim and held a brief grip-and-grin with a few Malaysian civil society activists. Other than that, Obama spent most of his time praising the Najib government. The White House has released just a perfunctory statement about Anwar’s trial and likely sentencing next week. 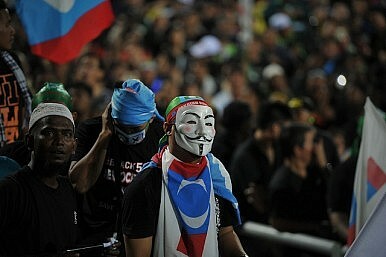 Ignoring the crackdown in Malaysia will eventually have long-term repercussions for the United States. Young Malaysians overwhelmingly support Anwar’s opposition PKR coalition, which won the popular vote in national parliamentary elections in 2013 but did not take control of parliament due to fraud and massive gerrymandering. They also tend to voice support for the civil society activists and journalists who have recently been targeted by the government in Kuala Lumpur. Many reform-minded young Malaysians have been mystified when the United States, which a decade ago had been so vocal about democracy in Southeast Asia, and which still has significant influence in the region, has said almost nothing about the regression from freedom in Malaysia. In previous eras, American rhetorical support for democracy, American pressure against authoritarian leaders, and American linkage of aid and investment to political change had played a critical role in fostering democratization in East Asia. In the 1980s, concerted American pressure on the governments of the Philippines and South Korea—after years of American tolerance of Ferdinand Marcos and a series of South Korean dictators—was a major reason why democracy prevailed in Manila and Seoul. A decade after Marcos gave way to the original “People Power” movement, sustained foreign pressure on governments in Cambodia and Indonesia and Thailand, in addition to many other domestic factors within these countries, helped precipitate political reform in these nations. Unfortunately, that type of pressure is absent today. The recent reality in Malaysia is at odds with the White House narrative.